The Kahles 5-25x56 K525i Riflescope is built to deliver precise performance for long-distance shooters, making it an invaluable optic that gives you the confidence to take even the most challenging shots. Threads in front of the objective lens accept filters, like polarized and neutral density, to enhance and improve views and image clarity in extreme conditions such as on snowy fields or on/near water. Its broad magnification range allows you to scan the terrain for targets on low power then dial it up to make a positive identification and take the shot. To add even more precision, the partially illuminated reticle is placed on the first focal plane so the subtensions remain accurate at all magnifications, and the thin hairs are illuminated to make it easier to see in low or challenging light. Shot corrections are made at 0.1 MIL/click with a broad 29 MIL elevation range to provide long-distance shooters the room they need. To make room for the illumination rheostat, Kahles integrates the parallax adjustment into the elevation turret, with the windage turret on the left side to make it easier to reach for those who shoot right-handed. These tactical turrets are exposed and finger adjustable to make fast corrections in the field, and the Allen key required to zero the riflescope is stowed in the cap on the illumination turret so there's no need to carry extra tools. Designed to withstand the rigors of the hunt, the K525i is built with a robust 34mm one-piece maintube made of lightweight and durable aluminum that can hold up to the heavy recoil associated with high-caliber rifles used in long-range hunting and shooting. The housing is nitrogen filled and O-ring sealed to make it waterproof and resistant to internal fogging in extreme weather conditions and temperatures. 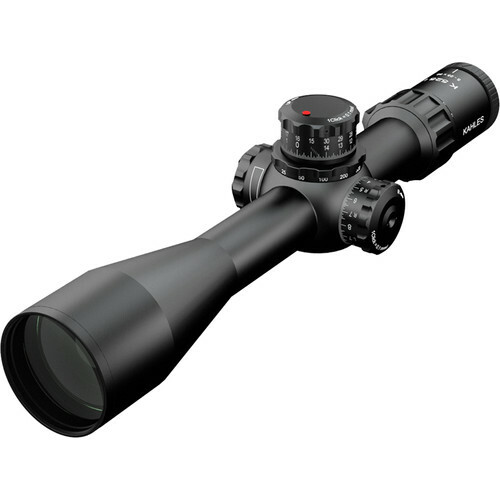 A neoprene cover is included to protect the entire riflescope from bumps, hits, and impacts while ensuring the ocular and objective lens remain clear and clean while moving through the brush.